You have a gemstone ring that you wear every day, but do you know how you can tell if it needs to be repaired? There are some telltale signs that the prongs of your ring have to be fixed, but most people overlook these clues and unknowingly expose their gemstones to risk. One of the first signs that something is wrong with your prongs is when your ring starts snagging your clothes and other things. If you notice such a problem, don’t put off inspecting your prongs or you could lose your gemstone. Usually, rings snag for two main reasons: One or more of their prongs are raised or they are worn out. Either way, you should take off your ring, take a good look at it to diagnose the problem, and have a jeweler fix the piece. Let’s see what can be done for your prongs in each case. If the prong is a bit raised above your stone and doesn’t lie flat on it, then you have a problem that’s easy to fix. Usually, prongs that are in such a position weren’t pushed down well enough when the stone was mounted. Or, you bumped your ring somewhere, and the prong got bent. If your prong doesn’t look thinned out from wear, then the solution is pretty simple. 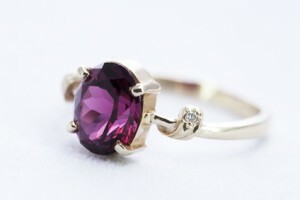 Take your ring to a jeweler, who will simply push the prong down so that it touches and holds the stone. This might seem easy, but we don’t recommend you to try and fix the issue yourself as you may damage your stone. Another common reason that prongs snag is that they are worn out and thin. In such a case, they become flat, their heads are no longer rounded, and that’s why the prongs catch your clothes or hair easily. Worn prongs are especially dangerous because they can break, at which point your stone can fall out of the mounting and get damaged or lost. What’s even worse, all prongs in the same mounting wear equally fast, so if one of them is worn, chances are the others also have gotten thin and pose a risk to your gemstones. If your prongs are worn out, you should get them fixed as soon as possible. Usually, the jeweler will retip them. This means that the worn heads of the prongs will be rebuilt with the same metal they were made of. How much the retipping will cost you will depend on the number of prongs that need fixing, the metal used, and the size of the prongs. If the prongs are too worn out, retipping might not be an option. In such a case, you may need to get an entire new ring head. This would be more expensive than retipping, and the price will depend on the type of mounting your ring has. In any case, you should have your prongs repaired as soon as you notice that something is wrong with them, and you shouldn’t wear your ring until you get it fixed.